Sometimes the simple charts are the best. This shows quarterly revenue for handset manufacturers (using the handset business unit for companies that do other things as well), for Q2 2012 versus Q2 2011. In the last 12 months Apple and Samsung grew, as did Sony (from a very small base). All the other ‘traditional’ branded manufacturers shrank. 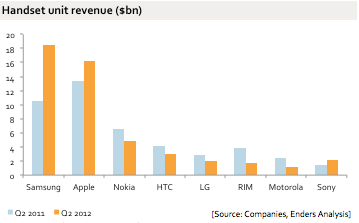 In total, Samsung and Apple’s revenue grew by $10.9bn year-on-year: the other branded OEMs combined shrank by $6.3bn. Not shown: Huawei and ZTE plus (literally) thousands of other smaller manufacturers in China and now India, which is increasingly difficult to estimate with a straight face: many of these are effectively Mediatek vendors. In effect, the market is polarising between ultra-low-cost manufacturers at the low end and high-volume high-efficiency manufacturers at the high end. Another (slightly flippant) way of putting it: the market is polarising between quad-core phones and quad-SIM phones.